Jigger, Mixing-glass, Skewers, Stirrer (long Spoon), Martini Glass. Stir all ingredients in an ice-filled mixing glass. 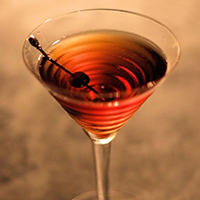 Strain into a well-chilled Martini Glass, garnish with a cherry.